This A2 ESL lesson plan contains activities, games and other resources for teaching countable and uncountable nouns. The recommended way to use these materials is through the TEFL Handbook app, which gives you offline access to everything on this site. 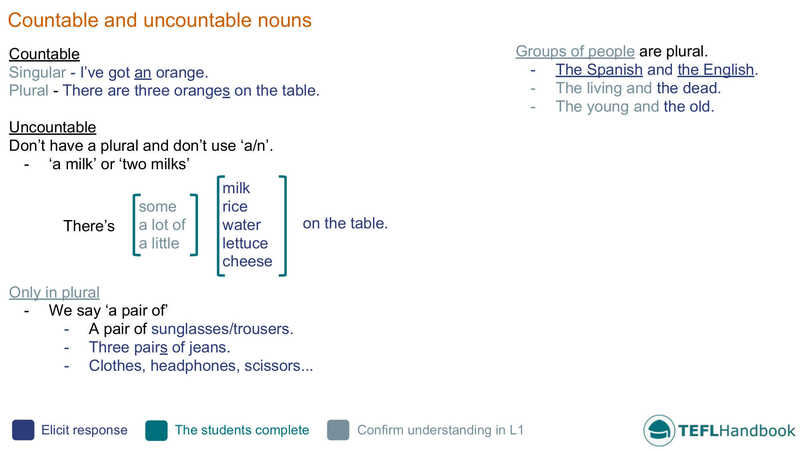 This ESL board work can be used to highlight the differences between the handling of countable and uncountable nouns. The colour-coded text highlights opportunities to elicit responses from your students. Start by creating a table on the board with the columns countable and uncountable. Have the students copy it to their notebooks, elicit different foods and add them to the correct part of the table. Next, elicit the different food categories, e.g. meat, fish, fruit, veg, drink and other. Have the students tell you which foods belong to each category. Also, now that they are thinking about the different categories of food and drink, try to elicit some more. Students could also come to the board and attempt to spell difficult words. Once the students have finished writing, they can switch books with a partner. They must then report to the class what their partner ate yesterday in the third person singular. After everybody has finished reporting, have a class discussion about who the students think has the healthiest/unhealthiest diet and why. This fun ESL role-play activity is a great way to practice countable and uncountable nouns along with quantifiers. With help from the class, create a menu on the board, complete with prices. Include the sections starters, main courses, desserts and drinks. Elicit whether each item is countable or uncountable. I’d like the ____, please? Can I help you / Are you ready to order? Do you want anything to drink?/Would you like anything to drink? Anything else?/and what about the main course? Once students are familiar with the dialogue, they can come to the front of the class to act out a restaurant scene. If possible, arrange the chairs and use props. Make it interesting and encourage each student to order something different. 20 points: Correctly spelt word that the other team doesn’t have. 15 points: Correctly spelt word that the other team also has. 10 points: Incorrectly spelt word that the other team doesn’t have. 5 points: Incorrectly spelt word that the other team has. Since the categories are quite restrictive, you could allow students to use their mobile phones and set a time limit. You may also want to be gentle when assigning the random letter for each round. 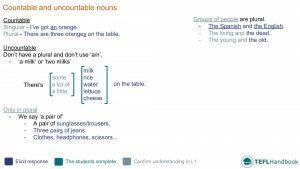 If you're looking for another approach to teaching countable and uncountable nouns, BusyTeacher's article 'How 'Do I Teach Countable/Uncountable Nouns?' is full of great ideas. For games, TEFL.net have a comprehensive list of EFL - ESL games for teaching countable and uncountable nouns. If you need a worksheet, islcollective have a fantastic collection. A personal favourite of ours is 'countable and uncountable' which practises most of the things covered in this lesson. If you have the facilities available, you may want to add a video to your lessons. The video below by EF International Language Centers complements the Out for dinner activity. We hope that you've found a few of these ideas useful. Our suggested next lesson is about expressing quantities. Be sure to check out our complete list of elementary level ESL lesson plans, A2 lower and A2 upper, as well as our entire collection of ESL lesson plans. Also, if you are an iOS or Android user, this lesson plan is available for free on the TEFL Handbook app. An ESL lesson planner for English teachers.